Battlefield V’s first post-launch addition, Overture, released today after an initial delay. The expansion moves the game’s timeline forward with new story perspectives and massive, tank-focused multiplayer battles. Overture is a mix of disappointing and exciting elements; it has terrific storytelling, but it also has one of the series’ least interesting maps. Also: Nazis. Overture’s biggest focus is on vehicle combat, specifically tanks. While Battlefield V’s initial selection of maps highlighted lesser-known battles, Overture delivers a different type of Battlefield experience. Vehicular combat and mass environments have always been one of the series’ biggest selling points. This first expansion manages to leverage that core strength into something that you won’t find anywhere else, not even previous Battlefield games. At its best, the result is explosive and amazing to play. At its worst, its romantic take on war paints too soft a portrait. These faults are most apparent in the new single-player war story, The Last Tiger. It follows a German Tiger tank crew during the final days of the war. As American troops push further into Germany, countless Wehrmacht soldiers press to the front lines in a nearly suicidal last stand. 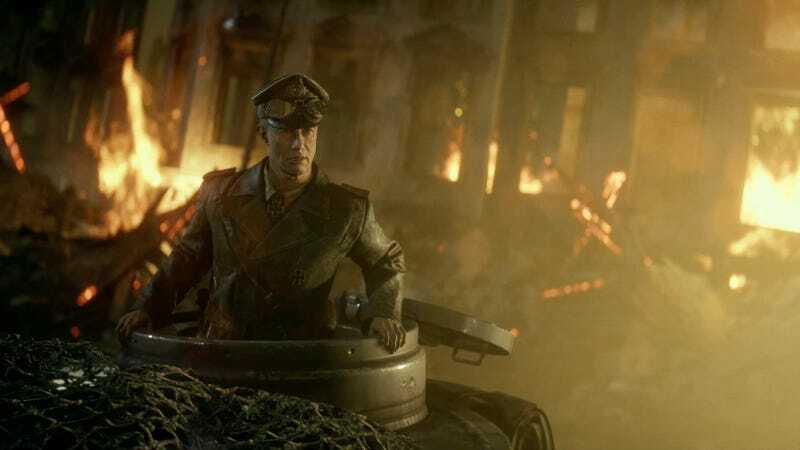 The player controls tank commander Peter Müller as he and the rest of his crew face off against a seemingly endless onslaught in a city along the Rhine. The mission is spent largely in the impressive and deadly Tiger tank, which was historically known for its ability to stand up to armored vehicles like the Sherman tank. The initial portions of the campaign feel like a unstoppable push through enemy lines. It really communicates how dangerous these machines were. Then the Allies rally, and things start falling apart. The Last Tiger wants to examine the ideology of Müller and his crew as the battle turns. As their defeat becomes clear and destruction mounts, each of them respond differently. Some express unspoken doubt, others stick to zealous adherence to the Nazi party line, and others voice fear. Battlefield handles these internal struggles well, and the characters, while broad, feel human enough that you’re drawn into their conflict. In a smart bit of storytelling, their tank assumes a metaphorical role. It is a machine they are caught up in, rolling forward no matter what. When they are inside that machine, they are part of something powerful and terrifying. In the rare moments they leave, they are fragile, fallible individuals. That war machine’s unstoppable drive forward culminates in one of the most astoundingly realized tank battles I’ve ever played. Shells ricochet, buildings crumble, ash dances on the air, and there’s a horrible sense of finality to the whole affair. But there’s a problem. It’s 2018 and I don’t need or particularly want media to humanize Nazis or their abettors. I acknowledge that history is complex and that’s especially true with this subject matter. I’m glad that Battlefield treats it that way. This is a well presented story and I’m pleased we’re dealing with real people instead of sneering villains. But The Last Tiger’s extraordinary production value is hell-bent on telling the tale of “the Good German” while glossing over the fact that you don’t exactly get to be a Wehrmacht tank commander without being an accessory to some horrible stuff, most of which is left off-screen and unspoken in this game. There are some nods in that direction—cruelly executed “deserters,” the horrified faces of civilians as German tanks roll by, a monologue from Müller about how he was punished as a child for being there and doing nothing while other children committed theft—but the framing of this story feels strange in the context of the modern day, when Battlefield V is being released. At the very least, there’s an additional layer of complexity that’s been shaved down in favor of telling a less complicated and complete story. It doesn’t work. There’s too little time between video game base assaults and one man stands against multiple fighter planes to truly explore the nuances. This is Battlefield’s Das Boot moment but I’d rather just watch Das Boot. Battlefield V doesn’t focus on the structural violence that these Nazis were complicit in but it’s something I kept thinking about while playing through a story that depicted their deaths as a noble tragedy. I’ve spoken to Holocaust survivors; I’ve seen Schindlerjuden hold back tears while addressing my junior high school class. Their stories matter to me far more than a romanticized tale about Nazi guilt conveniently dawning when defeat finally rears its head. 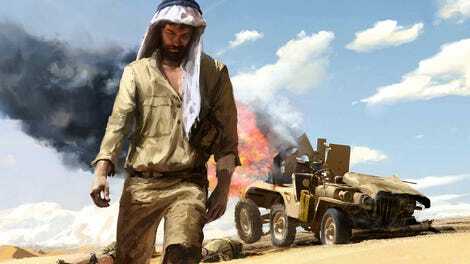 The Last Tiger is one of Battlefield V’s most exciting and thematically focused story missions, but it is a story that is painting a mythology that is still coopted by bad-faith actors and used today to justify gross injustice. The Last Tiger certainly doesn’t like Nazis but it still wants you to to appreciate their bravery. Whatever condemnation it offers is washed away by its flattening valorization of any and all forms of soldiery. While Overture’s story mission is a mixture of well-presented set-pieces in an uncomfortable narrative wrapping, its main addition to the multiplayer is a strange new map that has had just as many high and lows. The map, called Panzerstorm, is one of the largest maps I’ve ever played in a Battlefield game. But where most maps have a mixture of wide spaces and close combat, Panzerstorm is comprised of a few key capture points separated by massive open fields. Teams have access to a slew of vehicles, like tanks, mobile AA turrets, personnel carriers and more. When Panzerstorm clicks, it results in a type of freewheeling carnage unlike anything I’ve ever really seen in Battlefield’s multiplayer. Tanks face off, planes tumble out of the sky, and the horizon teems with explosions. But those moments are unfortunately rare. Instead, the map’s massive scale cases problems with spacing out units effectively, making normal infantry play untenable and leading to one-sided defenses as teams get cut off from their armored units. That’s dramatic, but not really fun to play. Once momentum is seized from one side, it can be difficult to turn the tide in the other direction. I expect that once the novelty of tank battles wears off, Panzerstorm will end up as a map that most players don’t really want to play. Thankfully, Overture also adds the first part of the Tides of War. This collection of challenges allows players to gain access to a series of rewards over several weeks. These include a unique helmet and even a new weapons, the first of which is the Vickers machine gun. The Tides of War’s challenges range from building enough barricades to resupplying teammates. Completing challenges earns points that eventually unlock goodies. It’s a nice way to help direct play outside of assignments, and should encourage players to check out classes outside their comfort zone. While I’m less sold on the Panzerstorm map, I’m excited to play through the Tides of War. I admire what Overture is attempting to do. It wants to round out the game’s view on World War II with narrative complexity while also offering a new kind of gameplay experience. But more often than not, that intention falls short. It delivers occasional bouts of action but has no staying power. The new story feels well intentioned but ill-considered, and the new map ignores what most players are looking for. Overture is a welcome experiment, but it unfortunately, it fails more than it succeeds.